Gripping right from the start (and long before the first bullet is fired), this sophisticated and naturally suspenseful period soap opera offers historical drama fans a fresh breath of French air following years of traditionally stagey WWII television fodder of the mothballs and museum reenactment variety. Created for the network France 3 by Frédéric Krivine, Philippe Triboit, and Emmanuel Daucé, the critically well-received A French Village has been a long-running success since its 2009 debut. Beginning its chronicle of the lives of more than a dozen characters during wartime sixty-nine years earlier in the summer of 1940, back in its native France A French Village is about to enter what is purported to be its seventh and final season. While it will take awhile for those in the states to catch up to that extent, this newly released slim-packaged, space-saving, and instantly seductive four-disc first season Region 1 DVD set from MHz (which delivered Denmark’s superlative smash Borgen to western audiences) gives us a great place to start. Impeccably well-researched yet refreshingly relatable, A French Village deftly avoids genre trappings by focusing just as intensely on the facts as it does on the deceptively real (but really fictional) figures that move the character-driven plot forward. Lushly photographed and exceptionally well-crafted, while a Blu-ray edition would obviously be the best way to fully appreciate the high definition origins of Village, the technical specs of the DVD release are – much like the show itself – on par with a feature film. Set in one of those picturesque communities where everyone knows everyone else (for better or worse), A French Village takes place in the fictional, titular French village of Villeneuve, which is situated near the edge of the Swiss border in France’s Jura province. Easing us into the rhythms of life in the countryside, long before the Germans arrive in Villeneuve in full force, Village's writers and directors begin to foreshadow things to come, planting clues like seeds which begin to grow, shift, and change, until they evolve into some of the twelve episode first season’s most complicated plotlines. Fraught with tension and laced with ironic twists and counterpoints such as in an unforgettable sequence where village schoolchildren stumble upon a cannon in the idyllic countryside while on a field trip – mere moments before bullets rip through the scene – the pilot is easily the standout of the series so far. Begging to be watched in quick succession, although it’s easy to fly through the first disc as conflicts arise involving the birth and subsequent hasty adoption of a young baby by village doctor turned mayor Daniel Larcher (Robin Renucci), the action begins to cool down midway through the four-disc set. Ramping up the drama as those in Villeneuve are forced to adapt to this "new normal," soon enough unexpected alliances start to form among residents from all walks of life as citizens band together to form an early version of the resistance. Taking advantage of the slightly slower pace to flesh out the characters even more, the stresses of life in the occupied community test preexisting relationships, putting an even greater strain on the romantic and family lives ofVillage’s population. Exploring the many shades of gray in between what perhaps during peacetime most would've deemed black or white or right or wrong, as Village starts incorporating action, intrigue, and espionage into some of the show's sudsiest love triangles, the series becomes dangerously addictive. Demanding your attention over the course of its phenomenal four final episode run (which rivals the first disc in terms of binge-worthy greatness), Village's first season finale leaves you excited for things to come in the seasons to follow. Although it is anchored by male main characters (as perhaps indicative of its patriarchal time period), A French Village earns bonus points for not discounting the community evident in its name in what amounts to a true ensemble effort. Capably alternating between the dramatic, frantic, tragic, and romantic – sometimes within the same scene – the series moves seamlessly from classrooms to dining rooms to brothels and beyond, incorporating the point-of-views of numerous residents into each roughly sixty-minute episode. Whether focusing on a young schoolteacher who finds her heart pulled in two very different directions or the young son of a communist who is forced to think quickly to keep his father’s secrets, the series juggles a number of plotlines and perspectives with the same level of care and commitment. And it's fascinating to see the personalities and priorities of Village's characters evolve over the course of a few months. Guilty on occasion of cutting a few corners in logic, at times A French Village is so jam-packed with plot that we can’t help but feel a few scenes that offered greater clarification might have been left on the cutting room floor. Yet, to its immense credit, the show’s flaws are extremely few and very far between. Abruptly cutting to the twelfth episode’s final credits immediately following a deadly confrontation between a handful of villagers that the show had been building up since the very first episode, needless to say, by the end of the successful first season, A French Village leaves us eager for the upcoming release of the second set from MHz. A must for Francophiles and history buffs, A French Village is also ideally suited to Acorn Media enthusiasts who thought they’d exhausted their catalog of thematically and/or topically similar historical dramas from Upstairs, Downstairs to Foyle’s War and beyond. 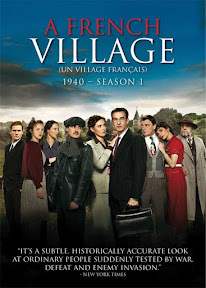 An intelligently written and sharply executed stunner of a WWII soap about everyday people doing their best to adapt and survive during wartime, A French Village also serves as a vital reminder that while facts are important, you can't underestimate the role that humanistic storytelling plays in ensuring that history lives on.